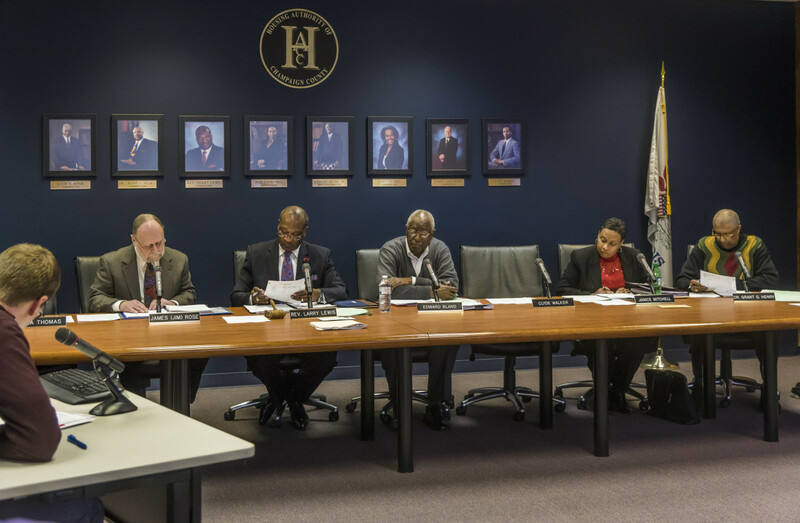 The board listens to a report during a meeting of the Housing Authority of Champaign County board at their Champaign, IL offices on Thursday, December 18, 2014. Since the beginning of the year, the Housing Authority of Champaign County removed nearly 190 names from their “no-trespass” list — the largest mass purging of the list in the past five years. Still, about 540 names remain on the list, which is posted on the housing authority’s website. As of February 2016, the list contained more than 700 names dating back to the 1980s. The current list contains only those banned from the housing authority’s property since 2000, except for two names. The list has included anywhere from 600 to 800 names over the past few years. 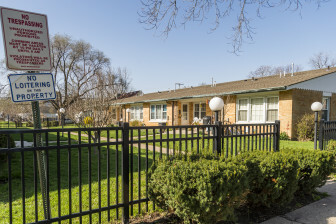 The housing authority oversees seven properties,- which are located in Champaign, Urbana or Rantoul – that provide apartments for more than 330 families. One of the properties is characterized housing at scattered sites while the others are apartment complexes. A person can be banned for many reasons and sometimes the reason is noted on the list. They include such activities as drug trafficking, violent behavior, or loitering. The ages vary greatly, from a 79-year-old man attempting to open the door to his old unit tor a 12-year-old resisting a police officer after curfew. About three-quarters of those on the list are male, and nearly all are black. Bland oversees the process in which he decides who goes on the list and who gets removed from the list. Washington Square, 108 W. Washington Street, Champaign, IL. on Friday, April 10, 2015. To be removed from the list, an individual can take their case to Bland and ask him to review it at any time. If Bland deems the request acceptable, the person is removed from the list and allowed back on public housing property. 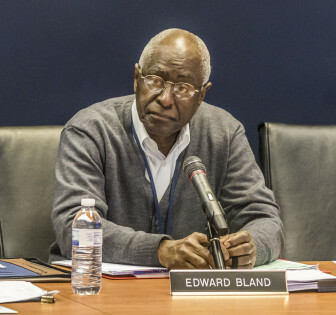 In the recent removal of names, Bland said, he did not meet with individuals. Instead he decided to take everyone off the list before the year 2000. “We didn’t sit down with any of those people because of the fact we didn’t need to. They have not come on our property and created a disruption over the past 16 years,” he said. Bland said placing someone on the no-trespass list is based on whether they create a safety problem. He evaluates an offender’s “activity and actions,” which are reported to him by police or residents. Bland then decides whether to place that person on the no-trespass list. The Danville Housing Authority of Vermillion County and the Bloomington Housing Authority of McLean County also maintain no-trespass lists, as do many housing authorities across the country. The Bloomington Housing Authority has been keeping a no-trespass list since 1994, but it does not post the list publicly. The housing authority executive director, Kim Holman-Short, said that any crime or disturbance on housing authority property could land an individual on the banned list. Working with police or other law enforcement officials, any housing authority staff can ban individuals from the property. Danville’s S.E. Clark and Associates was brought in to revamp the housing authority in November. Since then, Steven Clark, head of the company, said he has already removed 5 people from Danville’s no-trespass list of 798 names, which is not posted publicly. “More often than not I’ve been finding that our files are not documented very well. In my opinion, if they’re not documented very well, then they get another chance.” Clark said. “ ‘The manager said so’ isn’t good enough,” Clark said. Some lawyers and lawsuits have questioned whether the housing authorities’ practices lack due process. Columbia Place, 503 E. Columbia Ave. Champaign, IL on Friday, April 10, 2015. The practice of banning people from housing authority property through the use of no-trespass laws intends to prevent people from committing illegal acts, particularly selling drugs, said Deborah Thrope, a staff attorney at the National Housing Law Project. “While that’s the intent, I think generally some housing authorities around the country have taken it too far, so there has been some litigation around that is challenging these types of policies,” Thrope said. Most issues with no trespass lists arise when family or friends are found on the properties and accused of loitering, Thrope said. Consequently, they are placed no-trespass lists and are unable to visit their connections without appealing to the local housing authorities. “In my opinion, the restrictions violate the constitution in a lot of cases,” said private practice lawyer Gregory Beck, who wrote a piece for the University of Illinois Law Review about some of the issues regarding no-trespass policies. “Those kind of no-trespass warnings infringed on some important rights, and the housing authority should be very cautious before deciding to use that device,” Beck said. Thrope said that the no-trespass list policy is not always the best solution. She said that the reasons to put someone on the list are too broad and that there are a lack of “reasonable guidelines” for the housing authority to evaluate whether or not someone should fall into the no-trespass category. “Authorities have used it as a tool to keep undesirable people off the property. There are some cases where these policies really do violate people’s rights. These might be privacy rights, some federal laws and certain lease terms,” Thrope said. Beck argues that constitutional violations would be easier to avoid if the current process was changed. “The important thing to do is to provide . . . due process. If someone is thrown off a property where his family lives, there should be an opportunity to go before some kind of a hearing board to present evidence and for them to dispute the charges,” said Beck. Thrope said that the reviewer should not be associated with the housing authority that put them on the list. Executive director Edward Bland during a meeting of the Housing Authority of Champaign County board at their Champaign, IL offices on Thursday, December 18, 2014. “It could be a property manager who really hates that person who said they were doing drugs. What weight does that comment really have in that case? It’s a tenants right to have their guests on the property,” Thrope said. But Bland said the no-trespass list helps the housing authority maintain their number one goal: safety. “We have the responsibility to make sure our properties are safe for our residents… our role as a landlord is to have a safe community… If someone is sleeping in the stairwell, we’re going to put them on the no-trespass list,” Bland said. I wonder how many cases of frequent trespassing could be upgraded to felony charges or aggravated burglary for those on the ban lists?